Graham buys something off eBay (45:30) though it is unclear as to what he bought. The Mamiya Universal Press camera (https://en.wikipedia.org/wiki/Mamiya_Press) is discussed (50:15) though it is not one of the ones chosen from the book. It is one of the truly hideous designs (at least Graham thinks so and since he is writing the notes for this episode, it is declared to be Homemade Camera Podcast canon). Graham talks about a lumenography camera that shoots directly to paper with long exposures and can produce an image on the paper without any development (1:59:00). Some of the pictures from this camera can be seen on his Instagram page @grahamhomemadecamera. Nick shouts out to @Surgeon24hrs on Instagram for a camera he posted on the Flickr group’s page. Graham talks about sliding down the fidelity curve (11:30) and why he likes film that has been boiling in a Bulgarian warehouse for 20 years than good fresh film for taking pictures with pinhole cameras. He also talks about the commonalities between early computer-generated animation (https://www.youtube.com/watch?v=tN1A2mVnrOM) and the pinhole camera (27:30). They start talking about the physical principles and qualities that go into a pinhole for a pinhole camera (31:15). Pinhole size is very important and they talk about that pinhole size and how to calculate the right size for the focal length and film size using the calculator on MrPinhole.com website (33:30). Now that the pinhole has been taken care of, they begin a discussion of the body that will transport the film and keep the dark in (53:50) including oatmeal containers, matchboxes, Harry’s Razors boxes, and paperboard. Plus, they discuss what paperboard is! Graham moves his Scamera project off of the back burner and into the sink (1:25:30) and Nick talks about his Big Build. He also talked about selling a camera design through an Etsy shop (1:32:50) with details to be released via Instagram (@grahamhomemadecamera) and Flickr (FreezerOfPhotons). 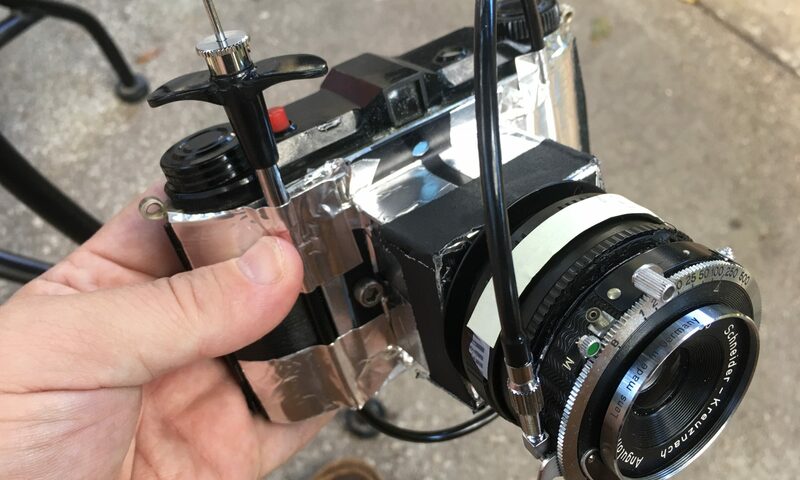 Shoutouts this week to Lucus Landers (@cropped_camera on Instagram and http://lucuslanders.com/) who is using cast and machined metals to build homemade rangefinder cameras. Also noted is a new podcast called WTF What the Film !? (https://www.stitcher.com/podcast/anchor-podcasts/wtf-what-the-film) hosted by a mysterious unnamed voice. The makers of the Pin-Blad are Light Leaks Lab (look them up on Facebook).